Whenever I drink juices like apple or orange, I produce this very slimy mucus that’s very, very thick in my throat. Sometimes it can be bothersome because I can feel it stuck in my throat and sometimes it gets stuck and chokes me up a bit. Is this normal? At the Yahoo Answers forum, someone asked the question above. 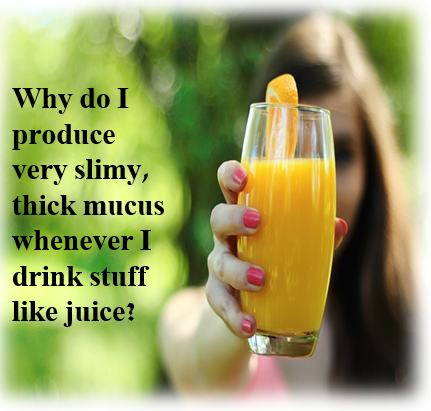 The juice contains some preservative and coloring that causes irritation to your mucus membrane. Or it could be a form of mild allergy reaction. Not only with drinks, but it can happen when you take certain food that you are sensitive or allergic to- such as seafood and peanuts. Personally, I suffer from this too when I take a lot of the bottled juices or yogurt drink. My throat will be so itchy and as I attempt to clear my throat (very loudly)- it gets even more uncomfortable. 1. Gurgle your throat with warm salt water. Melt table salt on a little hot water. Then mix with some room temperature water till it is warm. Gurgle your throat with it (bend backwards, make the ggrrrrrr sound and then spit out the water). 2. Take warm water with honey and lime. Drink it – you will feel that it clears your throat. Always be conscious what was the type of food/drinks that you have taken that trigger than reaction. After a few times, you should be able to identify the food that irritates your throat… and avoid the food in question. My mom used to warn me to do my best to clear my throat and not let the irritation simmer on since I’ve got a family history of tonsil and nose cancer. It is better to clear the irritation when it occurs so that the condition does not get worse. I remembered that someone I knew relayed her experience to me: she had a throat irritation and went to see a Chinese doctor. The Chinese doctor ask her to open her mouth wide, and the next thing the poor lady knew, the doctor pull out her tonsils with what that looked like a pair of pliers. According to the Chinese doctor, her tonsil was inflamed and if she did nothing about it, she would be getting NPC (nose cancer) a few years later. She said a number of nose cancers started off that way. You need to take note of getting this reaction each time after you eat certain thing and avoid those food altogether. After a while, you will get it figured out that some food, even though you love, are not worth taking for the discomfort later on. Whenever I drink water (yes water), my throat immediately becomes clogged. It feels like mucus, but nothing comes up when I try to cough. I am constantly trying to clear my throat. It’s very annoying. I’ve been to so many allergists, ear/nose/throat doctors, and general practitioners. I’ve seen lung specialists and others. No one can pinpoint the problem. Even when I try to look up the symptoms on line, there is not one website that says that water can cause the formation of mucus. In fact, it should do the exact opposite. I’ve gotten to the point where I won’t drink water as much because I know what is sure to happen. Any thoughts, comments or anything else will help a great deal. Thank you for sharing. I find your experiencing intruging. I’ve heard in rare cases people don’t like to drink pure water because they do not feel quite well after drinking it. A friend of mine suffer stomach discomfort when she drinks water. But in your case where it triggers an irritation and hence build up in mucus is something new. I will ask around and if I do have the answer, I will post it here for you. If you are drinking water, is it cold or cool water? If your throat is sensitive, mucus tends to form when you are drinking cold/refrigerated drinks. Try warm water and occasionally adding a little lemon/lime with honey. Alcohol has a hydrating effect and if your coffee is hot coffee it may not trigger the mucus. It can also be environmental. For example, when my house was undergoing renovation, there was so much of dust flying around. I also have a lot of mucus buildup during that time.